Latex mattresses can take many guises, from pure 100% latex to different variations when it is mixed with other synthetic materials which make the raw product go further whilst still commanding a high price. This can often lead to some confusion. The best analogy is to use the comparison of a champagne, made from a mix of grapes from Reims, France to a sparkling supermarket perry, made from pears. Whilst there is nothing wrong with either, to compare them is a bit misleading. We also provide the following handy quick guide detailing the types of latex. This is to highlight the difference between the blends of latex mattresses you may be faced with when looking for a new mattress. One of the cheapest versions of Latex mattress is known as graphite latex. This is a grey material and typically has about 30% of the composition being graphite, used as the FR (fire retardant) element. Latex is not naturally FR and because of the FR laws in this country, we are not allowed to use natural latex without some form of FR application. This is the latex used in FR layers to ensure the mattress complies. Graphite latex usually has a composition mix of around 30/70, meaning that the product is 30% latex and 60% synthetic latex. If we factor in the graphite addition of 30% of the entire material we can estimate that the actual latex within this product comes to about 20% of volume. This is not necessarily a bad thing, especially in the FR layer where this kind of latex is ideal. We would, however, state that as a solid mattress a full graphite core is not the best type of latex to use, as it is firm and not the best material for comfort. Unzipping a latex mattress in a showroom will quickly show you if its full graphite as the entire mattress will be a dark speckled grey colour. This product is often blatantly wrongly described within the majority of all mattress descriptions. It will rarely be referred to as graphite latex and actual depth of product used will rarely be mentioned. When looking at latex mattresses, your first line of questioning should be to establish the actual depth utilised within the mattress. Surprisingly, synthetic latex is a more expensive (raw cost) component than graphite latex. This is a completely man-made product in the foam classification but has the consistency and feel of latex. It is worth pointing out at this stage that the majority of products sold as latex will have a proportion of synthetic latex within the ‘mix’. 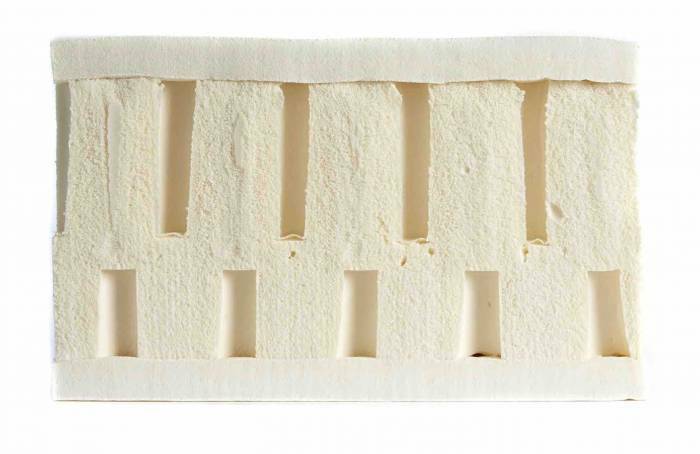 Our hybrid Laygel is, in fact, a synthetic latex equivalent but we clearly sell it as a hybrid foam rather than a Latex! See hybrid foams here. This is vital because 100% pure natural latex is a protein which will soon deteriorate and become host to bacteria and other things that cause it to break down. It is also not hypoallergenic in its raw form. 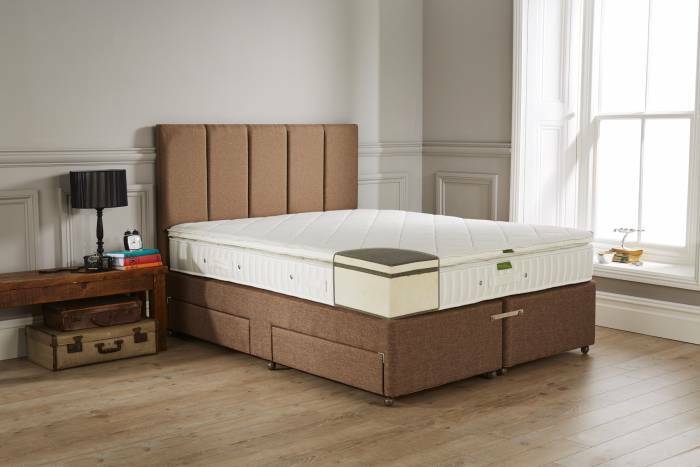 Synthetic latex is firmer than natural latex and so can provide a firmer feel in mattresses for a lower cost than natural latex which is less firm. The result is you need a lower density to get the same firmness that you would from a very dense natural latex. This is deemed to be an 80/20 mix. Eighty percent natural latex and 20 percent synthetic latex. Natural latex is its pure form has a soft density and additives are used to firm it up rather than increase the amount of natural latex. The raw materials are expensive and increasing its density means you need more of it hence the higher price tag when compared to synthetic latex. Quite simply put, it’s a more expensive raw material which you need more of to get the density for a mattress. This is one of the more dubious descriptions of a latex blend. Pure latex is almost an oxymoron as it is not a pure natural latex product, which it would imply. 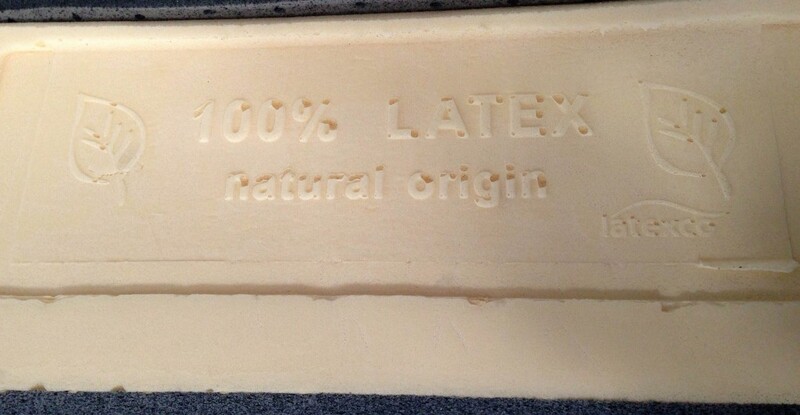 It contains 20% natural latex and 80% synthetic latex. So why is it called pure when it isn’t? We have no idea other than it being a marketing spin to confuse customers further. This has about 90-94% Natural Latex and 6%-10% forming additives and SBR (styrene butadiene) latex which is synthetic. Many companies will claim to be natural latex but you need to query the amounts. There are very few natural latex mattresses, many other companies claim natural latex but don’t specify the amounts. This is the most expensive type of latex and the best quality. It provides the best comfort and feel compared to other latex blends and should feel smooth as you mould into it. It’s incredibly breathable removing the heat issue and doesn’t suffer from potential off-gassing issues. We offer a range of 100% natural latex products which very few UK retailers offer. These top end latex mattresses are fully turnable and have a solid core. Sometimes you may see a stamp on the latex with the percentage blend such as the image below from one of our Fusion solid core latex mattresses as an example. This won’t be found on all latex as its only stamped on the end of rolls. Usually, there is only a handful of stamps per run or roll of latex foam this is to identify it from other blends. Once it has been cut into mattresses it can be hard to see quickly which blend it is. If in doubt always ask the retailer who should be able to tell you with confidence which blends it is. Not every mattress will contain this stamp, only those cut from the end of a roll the above image is an example of the end stamps used. Yet again there is another marketing spin on latex with the ‘organic’ label piggybacking off the natural latex term. We would provide the following guidelines when dealing with organic labels on Latex. We have yet to find any difference in material between 100% natural latex and organic latex. It is just a marketing tool to confuse and widen the market. We have already discussed how 100% natural latex is in reality 90-96% natural as other components are required. In the UK organic usually refers to pesticide-free but again we have yet to find a supplier of latex that will state this claim. We only refer to our latex as 100% natural and won’t use the organic label due to the confusion it brings. Organic latex is largely used as a description in the American bed market. A number of customers ask what blend Innergetic latex is. The answer to this is simple. We have no idea. In fact, no one within the industry seems to be able to say either. This makes us dubious. There have been ‘whispers’ it’s a blend of natural and ‘high quality’ synthetic latex but we can’t confirm this. We know that natural latex is the premium product with the highest value, so it would follow that any natural latex would market itself as ‘natural’. We don’t know what blend Innergetic latex is but would hazard a guess it is not 100% natural. We will leave the rest up to you to decide! This title again is very misleading. 100% Latex does not mean its 100% Natural. In fact, it can mean the opposite 100% synthetic. You need to know the blend for the percentage value to have any meaning. Don’t be fooled! Again there is no clear explanation of what blend Dunlopillo’s Latex is. If it was Natural surely they would say? In the absence of any facts, we would be cautious when trying to compare to an ‘unknown’ blend. An example of this would be if we labelled our Latex 100% John Ryan Latex. It wouldn’t tell you anything! It can be a very confusing world when it comes to latex. You need to know the exact blend of the latex to know what you are dealing with. Without knowledge of the exact blend, you are kind of shooting in the dark and maybe paying top prices for synthetic latex. You may also want to read the manufacture methods of latex and also our article on latex as a comfort layer to help you. Please feel free to contact us for more help.